PreventConnect’s David Lee and Harder + Company’s Kym Dorman at the poster session at the APHA Annual Meeting. 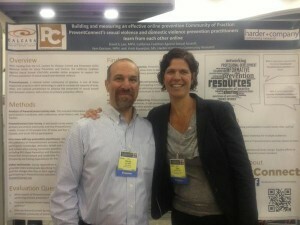 At the 140th American Public Health Association Annual Meeting in San Francisco, PreventConnect’s David Lee and Kym Dorman of Harder + Company Community Research presented a poster session titled Building and measuring an effective online prevention Community of Practice: PreventConnect’s sexual violence and domestic violence prevention practitioners learn from each other online. In a survey of 210 PreventConnect users, 97% reported they would recommend PreventConnect to others and 74% considered themselves part of the PreventConnect community. Respondents reported that their participation improved their organizational policy and procedures for prevention. In addition, several interview were videotaped where people shared there impressions about PreventConnect. Click here for a PDF version of the poster..